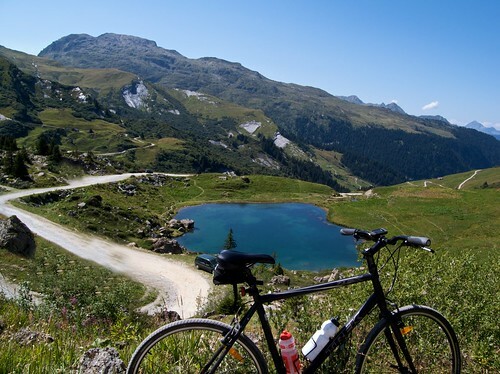 A perfect summer day for cycling in the beautiful Beaufortain region. 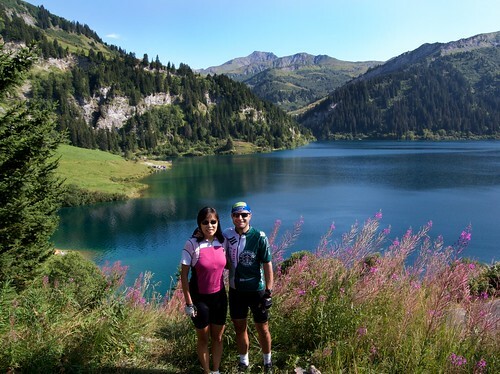 Here are details of the far side of Cormet d’Arèches including a visit to several beautiful and high unpaved cols. The plan? Starting in Beaufort cycle up to the Barrage de Saint-Guérin and above. 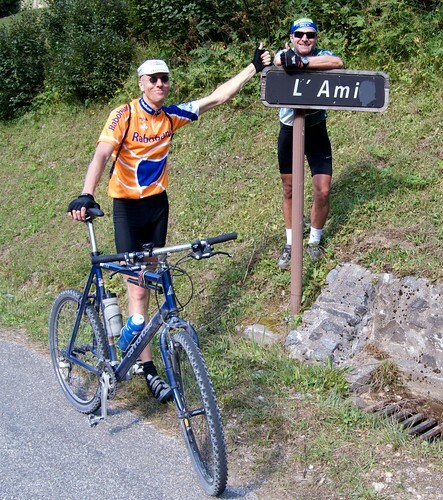 While the wives headed there directly, Eric and I first took a detour up the very steep road to Col du Pré. Along with Signal de Bisanne, this is the other climb that the Beaufort tourist office labels as “Mythique.” It certainly is steep. 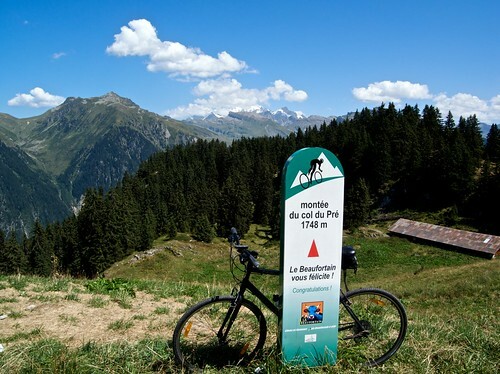 The high point is a good half kilometre past the official Col sign …. but don’t stop at either place …. 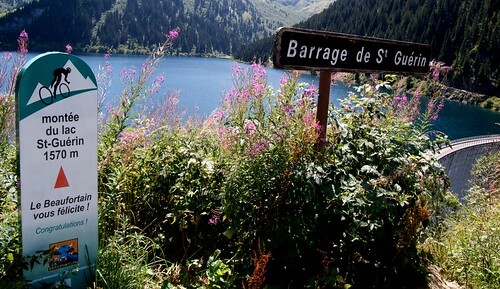 continue on a little further and the views of the Barrage de Roselend are just breathtaking (1st photo). Most cyclo-tourists climb Cormet de Roselend on the main D925 road via Col de Meraillet. 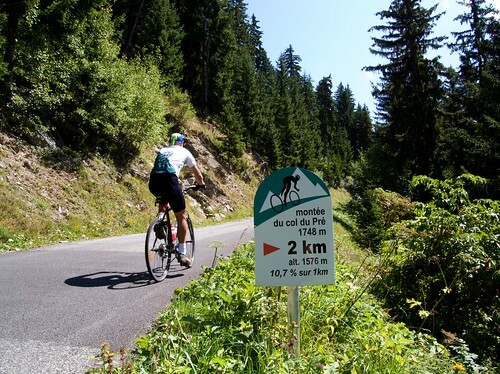 But via Col du Pré is far tougher and more scenic. 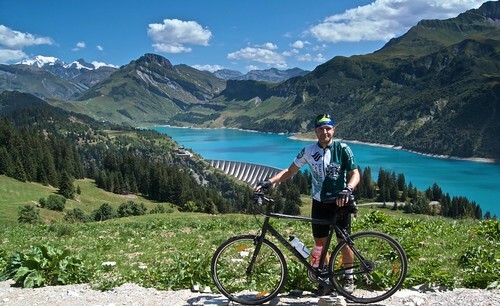 If you continue past the Col du Pré, the route descends and actually crosses the dam, rejoining the main road at Meraillet. After a few photos, we descended back towards Arèches turning left to join the route up to the Barrage de Saint-Guérin where we found our wives happily eating frites. 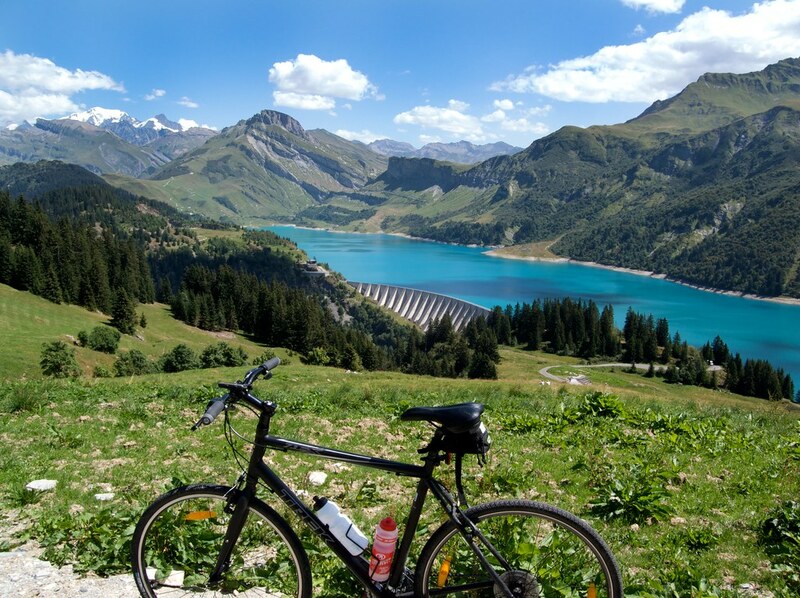 Above Lac de St Guérin is pretty steep ….. and NOTE that the road is not paved and is very bumpy for the last 3+ kilometres to Cormet d’Arèches. It is NOT ride-able by road bike and even my hybrid was pretty unhappy on the descent. Doreen and Katy decided to skip most of the gravel and instead hiked up to the little Lac des Fées. It’s truly beautiful up here and Eric and I greedily eyed a few other high altitude dirt roads for the future. 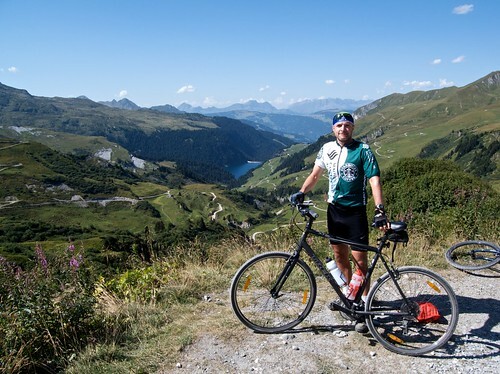 From Cormet d’Arèches it is possible to descend on a non-paved road all the way to Bourg St-Maurice – possibly looping back to Beaufort via the south side of Cormet de Roselend. Très jolies photos. J’adore le panneau du Cormet d’Arêches !! 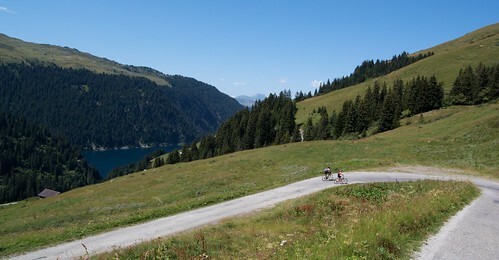 Sinon, depuis le Cormet d’Arêches, il y’a un chemin qui va vers le sud et qui rejoint le Col de la Grande Combe, puis le Col des Génisses et le Col des Tufs Blancs, noté comme cyclable d’après les Cent Cols. Ca doit être à faire, mais en VTT. 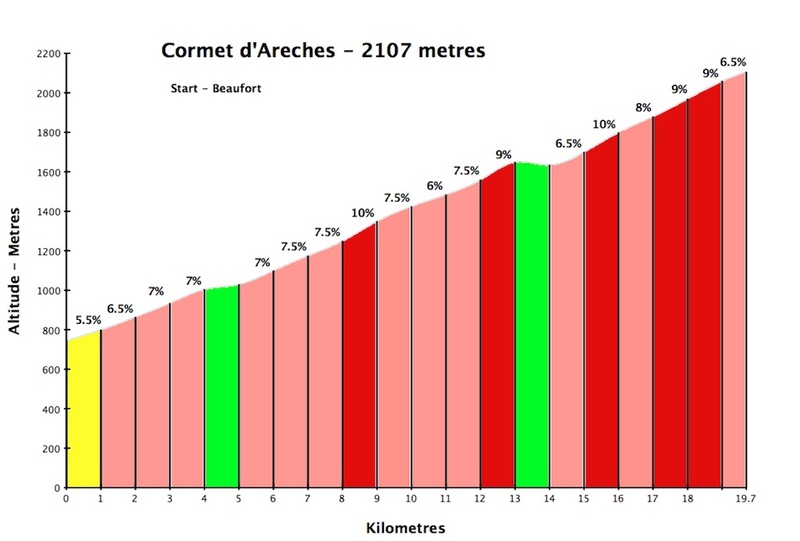 This summer i’m gonna climb the route to Cormet d’Areches. 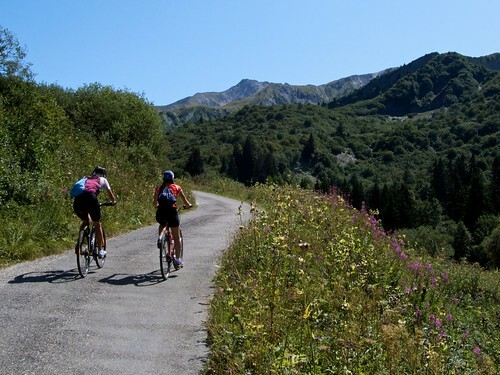 You mentioned that the last 3km are unpaved and you can descend it on unpaved roads to Bourg Saint Maurice. I was wondering if you know how long this unpaved part on the other side is. Is this just the first kilometres, like the last 3km you mentioned on the ascend? We’re staying in Bourg-Saint-Maurice so it would be nice to make a tour of it, instead of descending on the same side. We’ve got a backing vehicle with us, so it would be possible to transfer a few kilometres by car and then jump back on our road bikes. 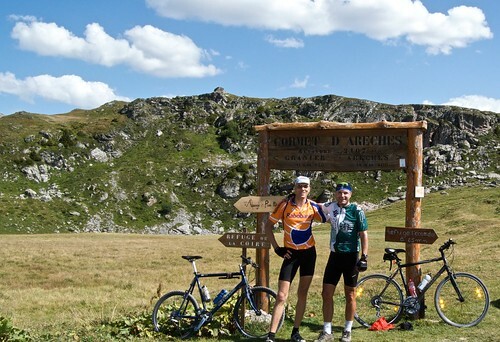 Sorry, I have never seen the other side of Cormet d’Arèches. I just remember the unpaved stretch being pretty rocky. Are you thinking of bypassing Cormet de Roselend on the way to Bourg? It is a really beautiful climb and descent. Probably more scenic than Cormet d’Arèches. if your are only doing one, I’d pick Roselend. Thanks for your response. Via google earth I discovered that the last 5 km on the other side are unpaved as well. So passing the top will be about 7/8km on unpaved roads. On a dutch cycling forum I have read that it can be done by road bike, as long as it stays dry, although it’s more suited for an mtb.